We are a family-run and family-oriented Labrador Retriever breeder who shows primarily in the AKC conformation ring and breeds for purpose of improving our own lines. The goal for each and every litter is for us to keep at least one puppy as a show prospect. We do not breed just to have a litter and sell those puppies. We are active members of Lake Erie Labrador Retriever Club where Judy serves the role of President as well as Webmaster for the club. We are also members of a local all breed club, Medina Kennel Club, as well as members of the National Labrador Retriever Club. We raise, train, and breed our dogs with our primary focus on only breeding for the betterment of our current breeding program which includes correct structure, temperament, and health. We enjoy our dogs as family pets first and then as show dogs. Our sons help with the raising and training of our dogs. 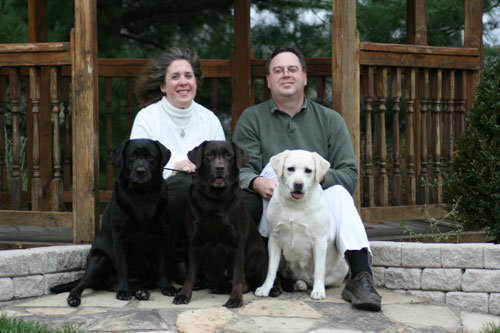 We purchased our first "registered" Lab in 1999 and we were hooked. Animals have always been part of our daily life and will always be part of our daily life, God willing. The Labrador Retriever is such a fun and lovable breed that adds so much to our lives. Who could ask for anything more? Our puppies have gone on to become AKC Champions and AKC Grand Champions as well as wonderful retrievers, service dogs, therapy dogs, obedience and agility dogs, family companions, and beautiful couch potatoes. Our puppies are raised within our home and their parents have their OFA Hip, Elbow, Eye, and Cardiac clearances as well as Optigen (PRA), EIC, CNM, and HNPK testing. Please see Current Litters. We are also in the process of testing our breeding stock to be dilute free (no dilute factors of silver, champagne, or charcoal will be part of our breeding program since the dilute gene is not part of a true purebred Labrador). Much to the dismay of dilute breeders who claim that this dilute gene is rampant and widespread throughout all bloodlines, my dogs have all come back as dilute free!